Hotrods: C section frame rails or Boxed section frames capable of carrying a v8 motor for example, ford pops etc...Oval Racing: Boxed and tubular chassis designed for non and full contact racing. Drifting: Full or part rollcage and suspension mounting for hard cornering etc...However if you would like something different and unique we may also be able to help, please contact us with an questions you may have. 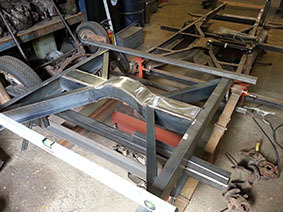 All our Chassis are designed on Cad software to ensure accuracy and correct steering geometry and ride heights, with an in house parallel chassis Jig that we can adapt for different projects and a draw action tube bender for tubular chassis we like to think that there isnt much we cant build! All components are either hand made or laser cut and then fabricated in our workshop, with suspension components also made in house. We are always sourcing and building our own projects as well as customers, so if you are unsure what you are after please get in touch as we have vehicles for sale once our projects are completed.